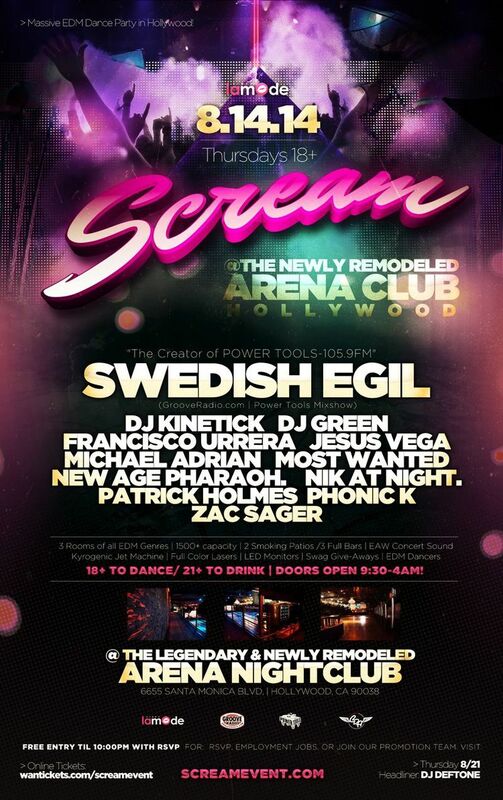 SCREAM Thursdays Grand Opening @ The Newly Remodeled Arena Nightclub! Every Thursday 18+ to Dance / 21+ to have cocktails! $10 cover before 11pm if you’re on the guest list! To get on the guest list, comment below with your full name (+ number of guests) and you’re good to go! You can also shoot me (Terry) a text at 2135596307. After 11pm it’s $15 cover regardless. ..::: ROOM ONE MainStage: EDM MASSIVE Arena :::.. The first thing that comes to mind when you hear the “Swedish Egil” is – is he really Swedish? The answer is unmistakably yes. Egil’s career began as a club DJ in Scandinavia and Europe. In the 80s, Egil created an overnight buzz on L.A. radio on KROQ-FM, breaking many alternative artists including NIRVANA, RED HOT CHILI PEPPERS, and UB40. He continued his manic devotion to new music in the 90s as Music Director at MARS-FM, then as founder of GROOVE RADIO, dedicated to club and DJ culture with artists such as MOBY, FATBOY SLIM, and THE CHEMICAL BROTHERS. Today, Swedish Egil is soaring ever higher on GROOVERADIO.COM and as DJ/Artist spinning at top clubs and events, and remixing records for Paul Oakenfold’s PERFECTO label. You can also catch Egil’s distinctive radio voice nationwide on SiriusXM Radio and as co-host of weekly mixshow “Powertools” (Power 106FM Los Angeles). and 11 more of your Local SuperStar DJs!!!!! ..::: ROOM TWO: DUBSTEP, TRAP, DRUM&BASS, CHILLSTEP :::..
..::: ROOM THREE: HOUSE, PROGRESSIVE, DEEP HOUSE, TECH HOUSE :::.. Dress in your Favorite Colorful Rave or EDM Attire!! !